If the Braves stadium project is such a great economic boon, then it must, by definition, be an economically self-sustaining project. And according to the latest financial information available for Liberty Media Group, the private company that owns the Braves, the company has over $4.8 BILLION in cash alone! Then why does Liberty Media Group need an estimated $1 BILLION bailout using taxpayer money? The answer is that Liberty Media Group doesn’t need (or deserve) nearly 1 BILLION of your tax dollars. Liberty Media Company has the means and wherewithal to completely fund a new stadium for the Braves in Cobb County without soaking taxpayers to do it. But Commissioners Tim Lee, Helen Goreham, Bob Ott, and JoAnn Birrell are all too eager to give them this $1 BILLION bailout without your consent. They each voted to ram this stadium deal through with little or no public input or transparency. And to add insult to injury, the commissioners recently asked your Cobb County delegation to the Georgia General Assembly for a pay raise for themselves! But the good new is that we still have an opportunity to stop this financial train wreck before it comes crashing into taxpayers’ wallets! You see, the Cobb County BoC still has to approve several tax hikes and government bonds (debt financing that is just a promise for a future tax) in order for this bailout to happen. 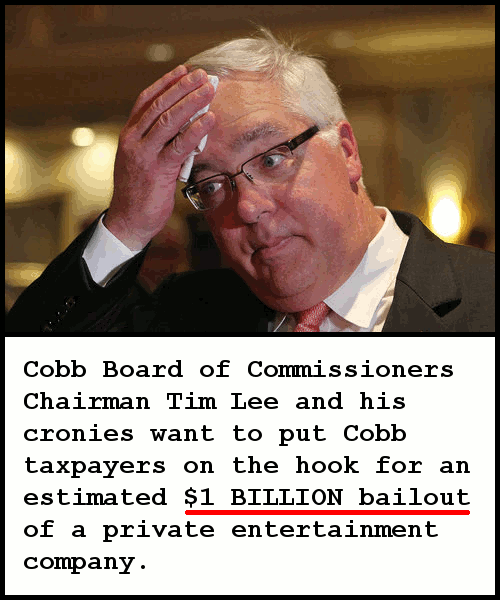 And the Cobb County BoC is slated to vote on these massive tax hikes just a few days from now! That is why it is critical that you contact your Commissioners and Commission Chairman Tim Lee and INSIST that they vote NO on all of the proposed tax hikes. Please let these commissioners know that you are watching these proposed tax hike votes closely and that you will not forget any action on their part to raise taxes. Tell them that any Braves stadium funding should come from the multi-billion dollar company that owns the Braves, Liberty Media Company. Tell them that if they wish to help fund the stadium that they should donate their already extravagant salaries to that cause! Regardless of the outcome of this tax hike vote, it is vital that taxpayers like you make your voice heard. We must put our elected officials on notice and ensure that they remember who they work for — you, the taxpayer! This entry was posted in Uncategorized by taxpayer. Bookmark the permalink.